Explore our critically acclaimed Collection with a fascinating guided tour. Let inspiration and creativity flow while creating an artwork in the Haworth-McLaughlin-Saltmarche Studio. A range of tour themes and hands-on art activities are available to both adult and school groups. 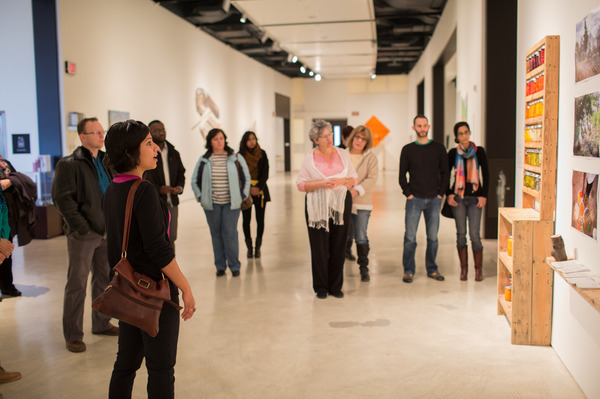 Upon request, Gallery tours and Studio activities can be connected to classroom curriculum. The AGW is pleased to be working in partnership with the Alzheimer Society of Windsor-Essex County to offer informal tours of the Gallery’s Canadian art collection in support of Alzheimer clients and their care partners. This program offers a calming and relaxing opportunity to engage with artworks that support processes of remembering and storytelling. Tours are facilitated by the Gallery’s education and curatorial team exploring themes in the exhibition Look Again! A special thank you is extended to AGW patron Mary Weingarden for her generosity in supporting this program. Enjoy your choice of a one-hour Gallery tour and a one-hour Studio activity—or select both! Tours are also available in French; please make this request when booking. K-12 teachers, book your field trip. Book your group visit 4 weeks in advance by contacting education@agw.ca or 519-977-0013 ext. 103. At time of booking, notify the AGW Education Coordinator of your special needs individuals and of any participants who may require specific attention during the tour. At time of booking, indicate if you wish the Gallery Tour to be conducted in French. Should you need to cancel your visit, notify the AGW Education Coordinator two weeks prior to the scheduled date of your group visit. Review the AGW Cancellation and Refund Policy document below for details. We look forward to hosting you at the AGW! AGW Program Cancellation and Refund Policy Pre-registration is required for all public tours, including school and adult group tours, and special events such as birthday parties. Please contact Jessica Cook, Education and Public Programs Coordinator to reserve your attendance. Please note that partial payment (a 50% security deposit by credit card) must be made at the time of registration to confirm your booking with the Gallery. Remaining amount must be paid by cash, cheque or credit card at the beginning of the tour or event. Cancellations must be received no later than 7 days prior to the tour or event for a full refund.